Marco Asensio and Francisco ''Isco'' Alarcon both scored twice to lead a second-string Real Madrid team to a 6-1 win over third division Melilla in the Copa del Rey on Thursday. Javi Sanchez and Vinicius Junior also netted as Madrid advanced to the last-16 stage 10-1 on aggregate after having won the first leg 4-0 in the small Spanish enclave in Africa. It was an important outing for Asensio and Isco, who haven't been getting many chances in the first team under new coach Santiago Solari. 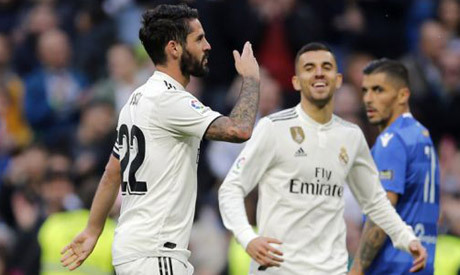 Isco was a starter for the first time under Solari and was named captain at Santiago Bernabeu Stadium. Levante also defeated second division Lugo 2-0 to advance 3-1 on aggregate. Jorge ''Coke'' Andujar and Raphael Dwamena scored late goals for the hosts at Ciutat de Valencia Stadium. Barcelona, Atletico Madrid and Sevilla went through on Wednesday.